Greetings again from the darkness. Is it a coincidence that I'm reviewing this moving on Charles Darwin's birthday? "Survival of the fittest" could be the subtitle to writer-director Tim Sutton's bleak film adapted from the novel by Frank Bill. 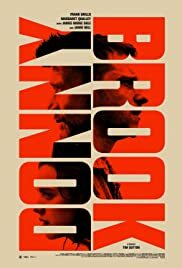 The film would have us believe that, once born into poverty and a hopeless existence, the only daily decisions to be made are: Do I try to survive another day? Should I kill myself? Should I kill someone else? Is that bleak enough for you? Sutton's film provides glimpses of each of the three questions, but mostly it's an expose' on the violence that is generated from a community of poverty, addiction, abuse, and crime. It isn't clear and doesn't matter which of those things comes first ... they all lead down the same path. 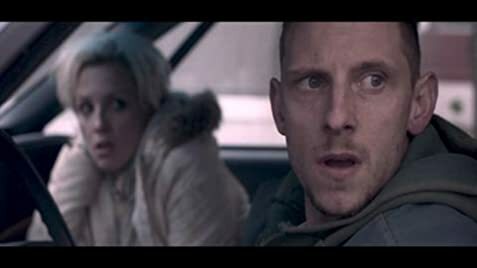 Jamie Bell plays "Jarhead" Earl, a military veteran looking for an escape route for his young kids and his junkie wife (Dara Tiller). Having a knack for fighting, and an apparent ability to take a beating, Earl decides the only way out is by winning the $100,000 grand prize for the Donnybrook ... a no-rules bareknuckle cage fight. Of course his only route to the entry fee is via armed robbery. Have I mentioned this is bleak? Earl doesn't talk much, but he tries to protect his wife from the local meth dealer, a brutal savage named Angus (Frank Grillo, THE GREY) who has an awkward partnership with his younger sister Delia (Margaret Qualley, NOTIVTIATE) as they make the rounds taking care of business. Angus is the type that resorts to violence in every situation, and we witness his lack of value on human life is just about every scene he is in. Delia is a bit more complicated, as she longs for a way out, and accepts even a momentary reprieve. To top it off, we have a Detective Whalen (James Badge Dale, "The Pacific") who is "chasing" this brother-sister outlaw duo ... well at least he chases them between drug and booze fueled sidetracks. The story takes place in the rural Midwest with towns and people those on both coasts never give much thought. When Earl finally reaches the Donnybrook, we are treated to what appears to be a redneck Burning Man festival where the revelers only stop hooting and beer guzzling long enough to sing the National Anthem while the American flag waves. We are left not knowing if this is a commentary on poverty, male aggression, or the forgotten class. It has some tonal similarities to the excellent OUT OF THE FURNACE, but isn't close to that level. None of filmmaker Sutton's first 3 movies have found much of an audience outside of festivals, and it's a safe bet this one won't either.